After more than 60 years as an entertainer, Omara Portuondo returns to her roots with a re-recording of Magia Negra, her 1958 debut recording. 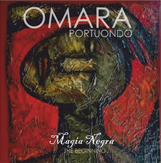 The original Magia Negra, a solo album recorded when Portuondo was only 25 years old, provided a showcase of Cuban music book-ended by two well-known pieces by America jazz icon Duke Ellington: "That Old Black Magic" ("Magia Negra") and "Caravan" ("La Caravana"). The new edition includes guests appearances such as Ivan Lins, El Micha among others. The album is available on Spotify, Deezer, iTunes and Amazon.